For many years, I've been pursuing with passion the exquisite colors and designs in Jaspers and to document each precise locality. Originally from Switzerland, I retired in the beautiful Arizona Desert, where I continue with enthusiasm the collecting, cutting and polishing to unveil the secrets of the World of Jaspers. 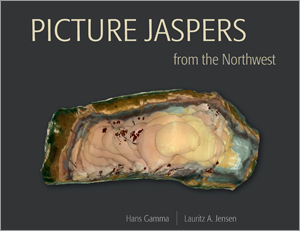 The newly released book PICTURE JASPERS from the Northwest, by Hans Gamma and co-writer Lauritz A. Jensen, is now available! This book features 184 pages with over 500 images and information about the Jaspers from the McDermitt area, Blue Mountain and the Owyhee region in Oregon, as well as Bruneau Canyon and Willow Creek in Idaho. 32 pages are dedicated to the popular and much sought after Morrisonite.